Reuters Stock Screener: Put part of Reuters’ powerful corporate information database into the hands of individual investors. The screening tool allows you to narrow down the universe of stocks based on companies’ five-year growth rates, geographic region and sector. MSN Money’s Top-Rated Stocks: With this online tool, you place check marks in a series of boxes with characteristics that matter most to you, including a high grade for fundamentals, valuations, or dividends. Top-Rated Stocks then looks at its database that ranks stocks on these criteria and gives you a list of those with the highest grades. 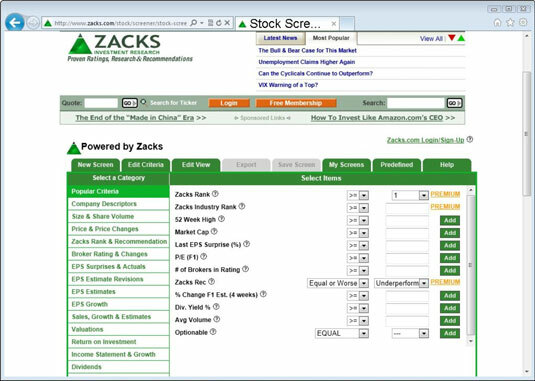 Zacks Investment Research’s Screening tool: The Zacks tool is one of the most powerful free screeners left. Zacks’ tool lets you filter stocks using the standard criteria but adds some unique things, too. For instance, you can filter stocks based on estimate uncertainty, which finds stocks where analysts strongly disagree over how much the company will earn in the next quarter. You can also find companies that have surprised Wall Street the most with earnings over the past quarters. Yahoo! Finance: This particular tool focuses on the basics. You can filter stocks based on industry, stock price, volatility, valuations, and analyst estimates. The screener is simple and easy to use. Finviz.com: The screener at this financial Web site tries to give investors access to the critical criteria they need, but still keep things simple. Google Finance: Google Finance uses charts to show you how companies’ ranks compared with others’ on various criteria. Access the screener by clicking the Stock Screener link on the left side of the page. SharpScreen via Nasdaq.com: SharpScreen is noteworthy because it provides users with an easy-to-use interface that lets you build a screen in seconds. USA TODAY’s Stock Screener: USA TODAY’s stock-screening tool lets you find stocks based on the industry they’re in, stock price, market value, and P/E ratio. Kapitall: The site lets you prospect for stocks using a fun, colorful interface that looks more like a video game than a stock-screening tool. If you click the button at the top of the page that looks like a funnel, you launch the site’s Super Screener, which steps you through the process of screening for stocks. It’s kind of fun. Seriously. You just need to register first in order to use the site. Morningstar’s Stock Screener: Rather than requiring you to pick through dozens of criteria you might not understand, you can just pick a growth grade, profit grade, or financial health grade, based on a scale from A to F. After you’re done, click the Show Results tab, and you see all the stocks that made the cut. Portfolio123: You can access the site’s basic screener if you register, which is free; however, you need to pay a $29 monthly fee to use most of the site’s features. Portfolio123’s related StockScreen123.com site is also worth checking out because it uses a less complicated method of building screens.